Most elderly place high value on their independence and it is extremely important to them to have input and control in their care. At Preferred Care at Home, we encourage our caregivers and family caregivers to support this wonderful spirit of independence in their loved ones, and at the same time watch for opportunities to offer gentle suggestions and assistance to promote health and a sense of well-being. For instance, involuntary loss of bladder control, known as urinary incontinence, is an area where a collaborative and individualized plan of care could greatly enhance an elderly individual’s independence and sense of control. Over half of all homebound seniors have some form of incontinence, though it occurs more frequently in elderly women than in their male counterparts. If it is not dealt with correctly, incontinence could lead to even more serious health issues and drastically reduce the quality of life. Mostly it is a byproduct of aging. As we age, a few things inevitably happen to us: one, the muscle tone in our bladder decreases, two, our bladder’s holding capacity decreases, and three, the muscular sphincter that controls our “on and off” starts acting up by not closing well or as quickly as needed. For some, external factors sometimes trigger urinary flow — factors such as temperature changes or even the sound of running water. In women specifically the pelvic floor muscles weaken with age and decreased estrogen. Understandably, this progressive inability to manage bladder control can be an embarrassing issue for seniors struggling to keep their independence and their life. Some deal with this issue by avoiding it altogether by ignoring leaks and accidents for as long as possible — which can cause serious health and hygiene issues. Others become withdrawn, in an effort to avoid public shame, voluntarily excluding themselves from activities that bring them pleasure and needed physical and mental stimulation. They become reclusive due to the sudden and unpredictable nature of incontinence. Essentially, they are forced to confine themselves to their home to avoid the uncertainty of an unfamiliar place where the location of the bathroom might be unknown to them. The two most common types of incontinence are stress incontinence and urgency incontinence/overactive bladder. Stress incontinence is the involuntary leak of urine due to sudden stress on the bladder muscles, and it is most often brought on by laughing, sneezing, or coughing. Stress incontinence starts out with a few drops of urine squeezed out by the sudden stress on the weak muscles and is often the first type of incontinence to be experienced as we age. In contrast, urgency incontinence, also called overactive bladder, is a sudden onset and overwhelming urinary flow urgency that cannot be delayed. This urgency comes on suddenly, and although the bladder may not have much urine in it, the accident is difficult to stop. This type of incontinence is seen alone or in mixed form with Parkinson’s disease or Multiple Sclerosis. The distinguishing feature is that once the flow is on, it is difficult to turn off. 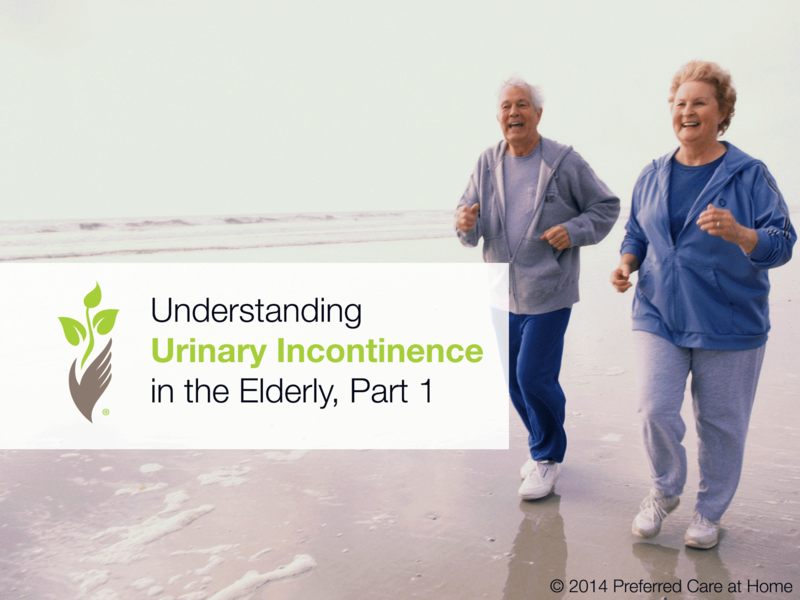 To learn many helpful tips for urinary incontinence in the elderly, subscribe to this blog.